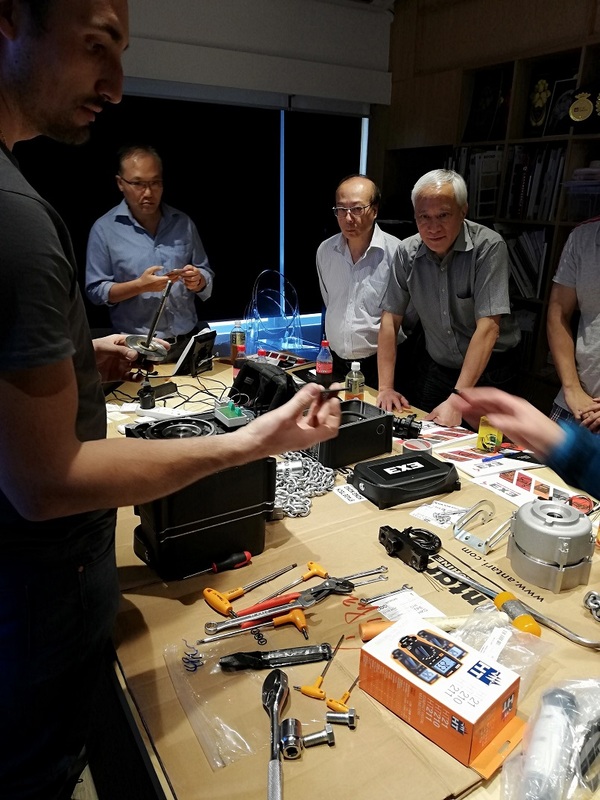 The EXE Technology training team had an extremely busy 2018, holding electric hoist training workshops in 40 cities all over the world! Not to mention the large amount of customer training sessions, which can be tailored for each company’s needs, carried out by EXE Technology Product Managers and the English, German and American Area Four Industries Direct distribution offices. Quite a busy year for EXE! 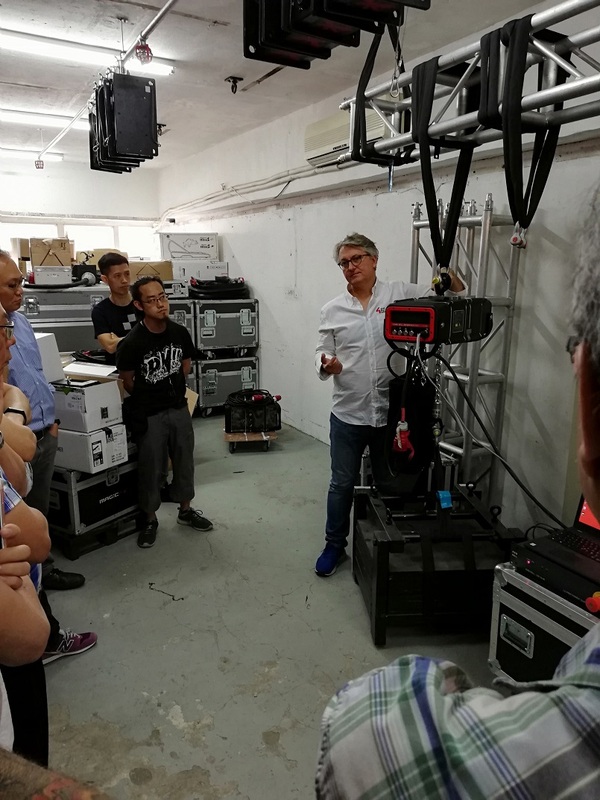 The last stop on the forty-city tour was an intensive three-day hoist-training workshop held from 7th – 9th November at the Stage Tech offices and warehouse in Hong Kong. Stage Tech is a well-established company that provides its wide customer base in Hong Kong and Macao with specialty pyrotechnics, stage-effects, custom-designed props, and installation art to transform their live events into one-of-a-kind, memorable experiences. 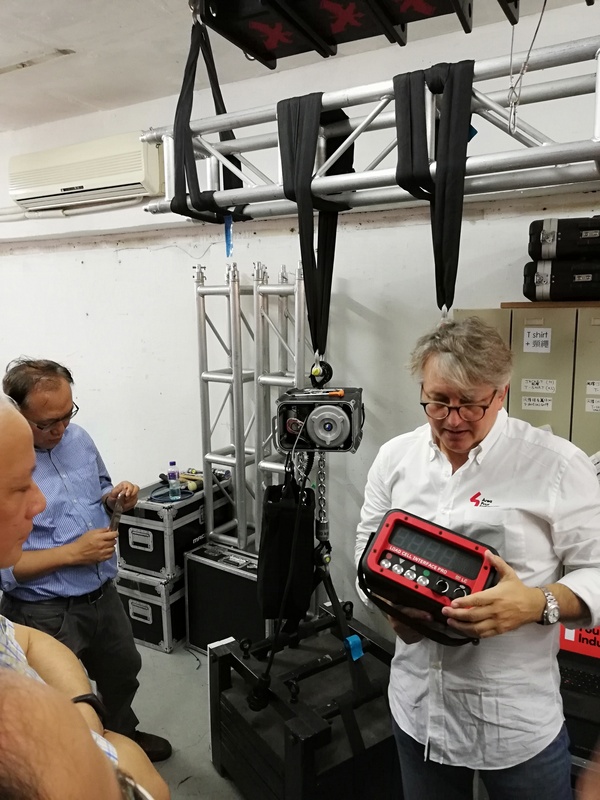 The goal of the workshop was to provide participants with in-depth information about EXE Rise fixed speed and EXE Vario variable speed electric hoists, and give them the opportunity to have intensive, hands-on experience with each product. Presenters during the three-day workshop included Gianluca Ferrarri (EXE Technology Automation Specialist), Fabio Prada (EXE Technology Managing Director), Louis Teo (EXE Technology Sales Director for Asia Pacific), and Tomas Gajdos (EXE Technology Sales Manager). EXE Technology is an Italian manufacturer of fixed and variable speed electric chain hoists, motorized trolleys and their relevant tracking systems, load cell interfaces, and hoist controllers for the entertainment and exhibition industries. Their products have been engineered to safely manoeuvre stage equipment, scenery, video walls & other related structures, before, during and after performances. A total of 12 people from 6 different companies in Hong Kong and Macao participated in the three-day workshop. Each training day was made up of two sessions – theoretical and practical – so participants could gain a 3600 understanding of chain hoist operation, as well as the design and construction of EXE Technology products. For the theoretical session, various safety regulations were discussed and how they relate to the manufacturing, use and operation of electric chain hoists. Certifications that EXE Technology chain hoists hold, their manufacturing class, safety standards they meet such as D8/D8+/C1, and how these benefit customers were also explained and discussed. The practical session involved physical presentations of EXE chain hoists and accessories (load cells, controllers, and chain bags) that demonstrated how they are used and their operation in various scenarios. To help get workshop participants deep inside of the mechanics and inner workings of electric hoists, an EXE product was fully disassembled during the session so construction and operation of the hoist could be fully shown and understood. During disassembly, information was provided on how to properly maintain, repair and service the hoist. All components, such as gears, the motor, and electrical parts, were reviewed and discussed. The innovative EXE Load Cell system was also presented, with its use and functions amply demonstrated through the use of a 700kg ballast. The Load Cell System consists of a standalone, integrated load cell display panel that is fully integrated in the chain hoist body to give riggers the opportunity to see, in real time, the actual weight lifted by the hoist during all rigging operations, thereby helping to increase safety. EXE’s new DST Stack Tracks system was presented on the final day of the workshop, which gave participants a complete overview of this multi-purpose, built-in rail system with modules that can move and turn LED screens, scenery and lights. Due to the modularity of DST components, they are easy to use and are stackable for optimized storage and transportation. To add to their ease of use, DST modules can be controlled with the most common control systems on the market. At the conclusion of the workshop, as was done with all workshops during the year, a Q&A session was held to answer all questions from participants and to clarify any subjects that were covered over the three days. All participants also received an official certificate of attendance from EXE Technology. EXE Technology products are quickly becoming the professional’s choice for live events and for permanent installation in a large variety of venues. To go along with their increased use and installation around the world, EXE is committed to ensuring its users are fully informed and trained in their proper use and safe operation. The workshop tour held this year, and ending in Hong Kong, is a perfect example of this commitment. Contact EXE Technology, or your local EXE Technology distributor, today for more information on their range of products or to receive a price quote.